When I lived and worked in Wales, and was taking school pictures, I came across a Headmaster, Gwyn Pierce Owen, who was also a Football League referee. Sniffing out a story for the Caernarfon and Denbigh Herald [and an opportunity to get behind the scenes at St. Andrews! ], we agreed that he'd call me when he was working a game at St. Andrews one day. 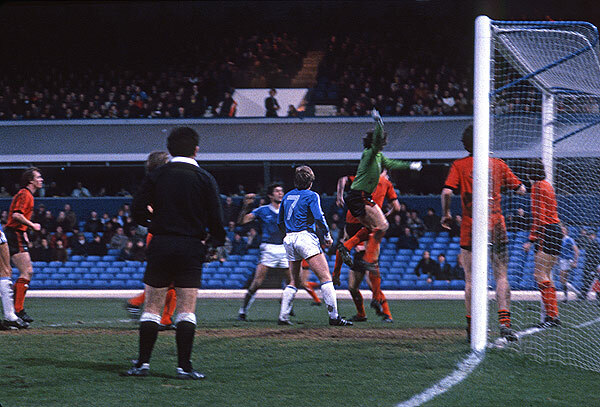 The call from Gwyn came several months later and the following account and photographs are from the Blues v Ipswich First Division game on December 20th 1980 . . . I lived in Penrhyndeudraeth, Gwynedd at the time, and invited my young neighbours Iwan and Elfyn Hughes to come along. At the very least I thought the experience might sway them from the likes of Man U. and Liverpool . . . not! I wanted to show the boys the best of 'my city' and I seem to recall that we spent some time there, an early lunch included, and then headed over to St. Andrews. This was nothing new to me as I had done it hundreds of times since 1964, but this was different. I had written for a Press Pass to accomplish this assignment - how wonderful that I had been chosen! - and it duly gave us entrance to the Stadium. 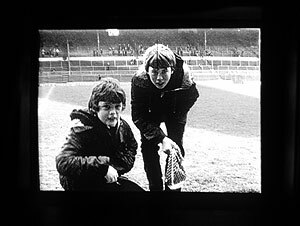 I seem to recall us waiting for my Referee friend Gwyn Pierce Owen, and this gave us the opportunity to walk around the pitch taking photographs. Elfyn left, and Iwan at the Railway End. I wanted to show off our best stand, the Main, in the background of most images as the others were decades old and looked it. Now in 2002 the main Stand is the odd one out which is a great relief! It is due to be replaced after we have established ourselves in the Premiership. Looking like "Two refugees from Salonika" as my Dad used to say, the boys pause for another shot. Should that be Thessalonica Dad? Both boys are in their 30's now but gosh!, that Iwan is still a real Pool poser!! which was on ITV that night. Aaaaahh, the hallowed ground of the boot room. Now don't ask me who's is who's!! Judging by the numbers I assume these were used for training. With time running down before kick-off, both managers show up at the Ref's door for a choc-stick, erm, I mean with their team sheets. 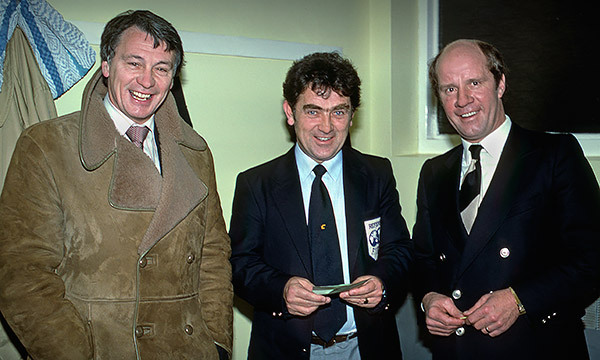 Left is Bobby Robson, Ipswich who went on to manage England. Center is Gwyn Pierce Owen, Referee and 'Prifathro' at Llanddona on the Isle of Anglesey. 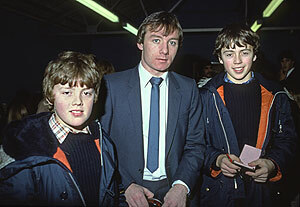 Right is Birmingham manager Jim Smith. Getting these three relaxed was an achievement and I think I accomplished it by telling 'em Blues were gonna win . . . hence the laughter. 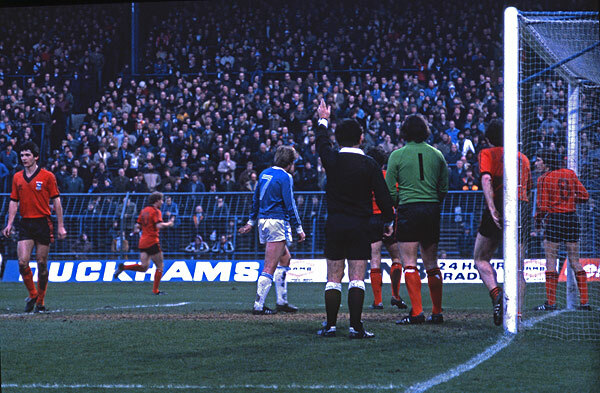 I had just met Jim Smith and wanted to let him know I was a Blues fan, but it was met with a bit of anger from Robson who duly noted that fans are not allowed in the Referee's dressing room before a match . . . oh dear! Gwyn Pierce Owen, headmaster of Llanddona Primary School Anglesey, is no ordinary headmaster. He is one of those special breeds of masochist who dares referee football matches in that cauldron of controversy, the Football League. His weekend "hobby" demands that he travels the country, and such are the extremes that one week he could be refereeing at Hereford United, and the next, Manchester United. So as not to interfere with his full-time occupation as headmaster, any weekday matches allocated to him are fairly "local", such as Chester, Wrexham, or Shrewsbury. For this "Herald Special" I met Gwyn at the recent Birmingham City v Ipswich game which had a distinct bearing on the top of the First Division Table. 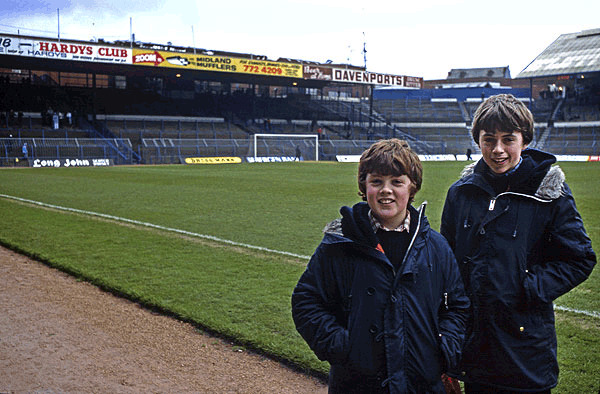 The round trip to St. Andrew's is over 200 miles from Gwyn's home near Beaumaris, but Gwyn is fortunate in having his close friend Vic Owen around to chauffeur him to the country's football stadiums. When I arrived at the ground at 12.40 p.m., Vic was well into his steak and chips, courtesy of the club, but for Gwyn it was time to start work. A day and a half of heavy rain had left the pitch pretty well sodden, but after a quick inspection Gwyn was able to declare the pitch playable as it was now drying fast. He was accompanied on the inspection by one of his linesman, Derek Capey from Stoke-on-Trent, who joined Gwyn and I in an exclusive lounge for tea and sandwiches. We were also joined by Gwyn's second linesman, John Ball from Leicester. 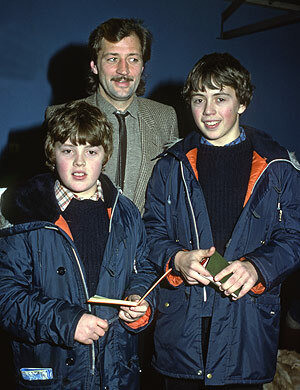 Gwyn then returned to his dressing room and was visited by Hugh John whose TV company was covering the match, and is well known to us in Wales as a contributor to HTV's "Sports Arena". 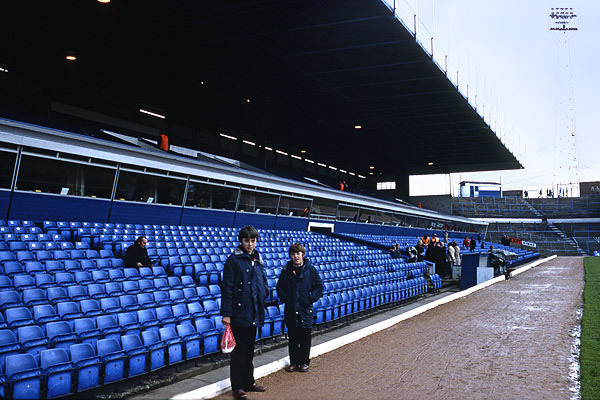 A Football League rule stipulates that team sheets should be handed to the referee half an hour before a match, and thus the managers, Jim Smith of Birmingham City, and Bobby Robson of Ipswich arrived on cue and exchanged greetings, stories and jokes before departing to give last minute instructions to their teams. At five to three the teams are out on the pitch loosening up and its time for Gwyn and his linesmen to join them. 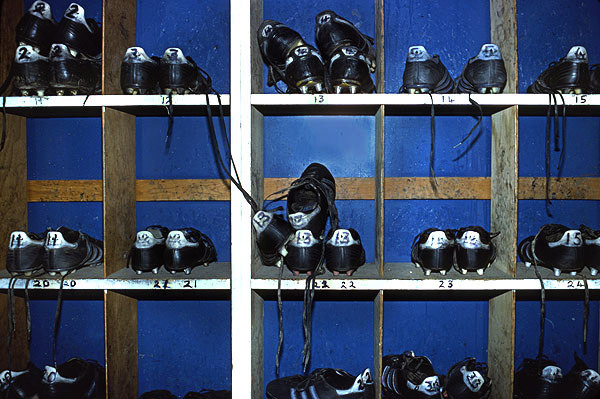 On leaving their dressing room they pass the player's dressing rooms, and the Birmingham City boot room, where many a famous player has started his career with the most recent of them being Trevor Francis, now "on loan" to Nottingham Forest. Then on past the gym to ascend a long corridor underneath the main stand . . . big enough to drive a bus down! This then forces them right at a "T" junction and delivers them onto the St. Andrews pitch where they are greeted by the customary boos, which all referees take with a pinch of salt. Ipswich were a goal in front at the interval. From Gwyn's point of view the half was tidy and nobody had questioned any of his decisions. The second half saw Ipswich collect two more goals and gain two valuable points in their quest for the league title, while Birmingham managed just one in reply. The after-match inquests on television and in the Press did not query any of Gwyn's decisions which is compliment indeed to any referee. 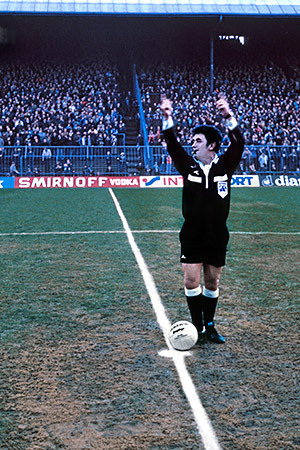 It is often said, "If a referee is not noticed then he has had a good game". I'm sure everyone at Llanddona School will give him ten out of ten for that! Gwyn calls the captains over for the coin toss. Note the heavily sanded centre circle . . . and Gwyn's chubby knees. Keith Bertschin, now back on the Club staff, trots away after Blues go close but no banana. "Right here" says Gwyn. 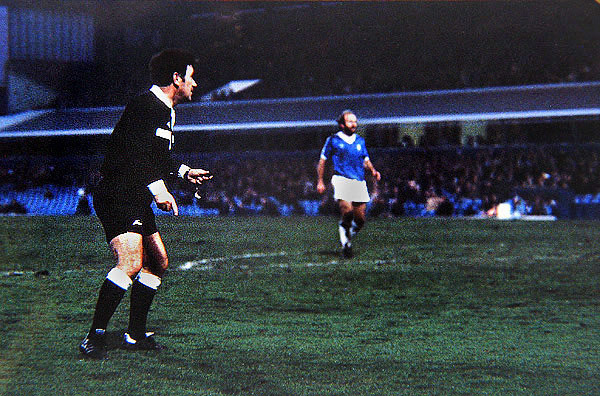 Even the presence of his photographer friend couldn't persuade Gwyn Pierce Owen to give the Blues a penalty! Frank Worthington and others getting a laugh out of a free kick situation. Terry Butcher clears from our beloved Frank. 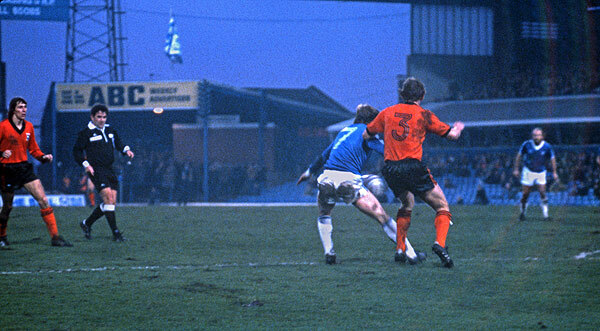 Alan Curbishley gets a cross in. David Langan gets a cross in. Gosh!, see that refreshment hut at the back? I bought many a lousy pie there! Then off to the right are three gentlemen in white coats whom Iwan thinks are members of the John Baker Appreciation Society . . . but I don't think he was being nice! Alan Ainscow [?] gets a cross in . . . gosh!, ain't this creative ritting?! That looks like Alan Brazil on the left . . . well, either it's him or his twin sister. Butcher clears with a header. Isn't that Joe Gallagher on the right? Isn't that Mrs. Henderson on the Tilton? 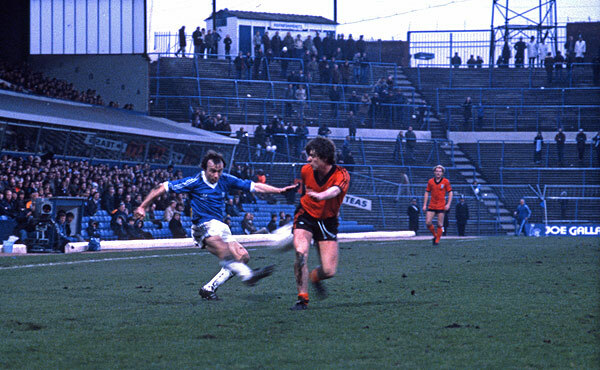 Cooper clears a Blues corner . . . the little tyke! Archie lays a ball inside. Gosh, how come we didn't win everything when Archie was at the Club?! 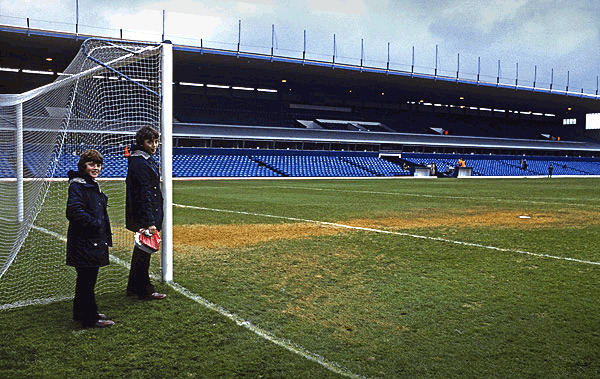 With time running out on Blues, Gwyn Pierce Owen watches the goalmouth action closely. Being a brand new Welsh speaker I enjoyed the little conversations I had with Gwyn in our 'foreign' lingo whenever he was near my position by the goal. Unfortunately my Welsh wasn't advanced enough to ask Gwyn, "Oi!, is that your blind dog I hear howling in the Main Stand?" Not exactly the result any of us would like but a chance to go behind the scenes one last time and meet the likes of Malcolm Beard and get the following pictures . . .
Da boys and Frank . . . who appears to have his eye on some crumpet across the room. Blues forward Keith Bertschin signs for da boys. With Blues right-back David Langan. David said, "Aha!, someone my size for a change!" Iwan says that this is Arnold Muhren one of Ipswich's 'Dutch Masters'. Not sure I should believe him cuz this is the same Welsh boy who thinks that Hertz Van rental is a Dutch painter.